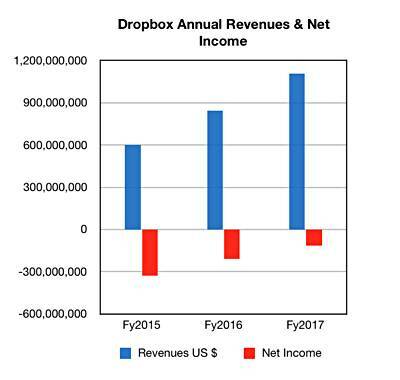 Analysis A look at Dropbox's IPO filing suggests a conservative company controlling costs and heading towards profitability this year. It has passed the 500 million user count, though only 2.2 per cent (11 million) of that base are paying customers – the rest use its free services. The firm had hosted its file sync'n'share data on AWS infrastructure but has started building in-house infrastructure, using leased colocation facilities to cut costs. The SEC IPO filing opens Dropbox's books from 2015 onwards, and the numbers are reassuring enough. Quarterly revenues show steady growth with no seasonal effects. The filing doesn't reveal net income per quarter, so we have used what we can, meaning loss from operations, as a proxy. While not reducing on such a steady gradient, losses are shrinking. For executives, customers and investors, the declining loss trend is evidence of financial solidity. A comparison with Pure Storage and Nutanix shows that Dropbox is far, far away from frantic growth fuelled by copious debt. This is not a classic Silicon Valley VC-funded, growth-over-profits operation according to the playbook used by Pure and Nutanix. In fact the trend is for 2018 to be the year in which Dropbox becomes profitable, unless the company spends big on expanding its infrastructure. Annual revenue per user (ARPU) is also outlined in the filing and this is meagre, compared to Box and other business sync'n'sharers. It currently stands a $111.91/user, having been $113.54 in 2015 and $110.54 in 2016. Current Box and Egnyte ARPUs are $6,171 and $4,203 respectively; vastly higher numbers. "Dropbox has built a $bn+ revenue business by targeting consumers and prosumers, going after individuals and small organisations with double-digit employee counts while Box has experienced their success targeting the large enterprise, going after Fortune 5000 companies with tens of thousands of employees. "With Dropbox currently earning $100 of revenue per customer compared to Box who is earning $6,100 of revenue per customer, it is abundantly clear that Dropbox should not be categorised as an enterprise company." Fair enough. But what we take away from this is that there is lots of scope for Dropbox to drive up its ARPU, as well as its number of paying users. Doing either would do good things with its top and bottom lines, while doing both would send these numbers rocketing. That's enticing but also a tad concerning, as Dropbox would likely have to get enterprise sales teams in place. So far it has largely gained customers through word of mouth and referrals. Implementing and operating a sales team infrastructure, either direct or through a channel, costs cash. Of course it could simply buy one by acquiring a business file sync'n'share competitor that has a sales team. And that might be one direction for cash from an IPO... seems unlikely. Recent storage IPOs have seen share prices drop substantially after the IPO – Pure Storage and Tintri spring to mind. Dropbox looks to be in a different place, as it has an evident pathway to profitability in the near future, and its business fundamentals are solid. Jain at Egnyte said "Dropbox has shown the ability to generate cash while significantly improving their margins, which puts them on a short path to profitability. It is my belief that Dropbox will have a strong debut and could potentially fulfil their $10bn private valuation in the first 30 days on the public market." There is lots of potential for relatively fast revenue and income increases by Dropbox, assuming no substantial changes to its competitive environment, such as Apple making iCloud a worthwhile competitor.